This path-breaking book addresses the oft-avoided, yet critical question: where are the women located in contemporary diplomacy and international negotiation? The text presents a novel research agenda, including new theoretical and conceptual perspectives on gender, power and diplomacy. The volume brings together a wide range of established International Relations scholars from different parts of the world to write original contributions, which analyse where the women are positioned in diplomacy and international negotiation. The contributions are rich and global in scope with cases ranging from Brazil, Japan, Turkey, Israel, Sweden to the UN, Russia, Norway and the European Union. 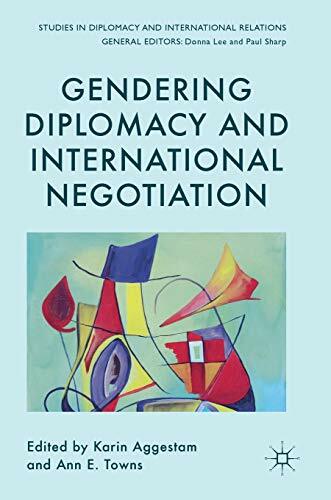 This book fills an important gap in research and will be of much interest to students and scholars of gender, diplomacy and International Relations. The volume also reaches out to a broader community of practitioners with an interest in the practice of diplomacy and international negotiation. Karin Aggestam is Pufendorf Chair Professor at Lund University, visiting professor at Monash University and honorary professor at University of Queensland. Ann Towns is Associate Professor in political science at the University of Gothenburg and a Wallenberg Academy Fellow.